Salsa Verde can literally be translated to Green Sauce and is packed full of fresh herbs. Salsa Verde smells and tastes wonderful. As the name suggests, the sauce is Italian and was modified by the French and later the Germans. 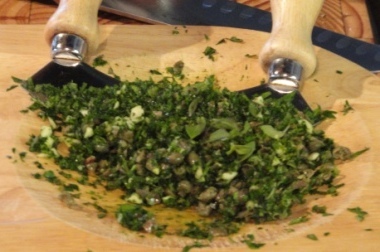 Parsley is an integral ingredient in this sauce and it is the basis for both Gremolata and Chimichurri. Recipes for both Salsa Verde and Chimichurri feature in Lavender & Lime. The French add tarragon to their version known as Sauce Verte. The Germans add a variety of green herbs and this is my philosophy – I use what ever fresh green herbs I have in my garden and the herbs I feel will most compliment the food I am making to go with the Salsa Verde. These include sage, chervil, dill, rosemary, basil and mint – let your imagination run wild. I’ve had some vegetarians join my other houseguests and so can’t do the challenge, will have to do it later, but I haven’t forgotten.